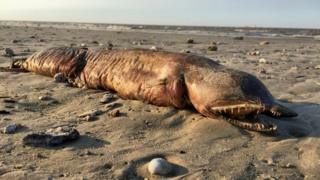 A mysterious fanged sea creature that washed up on a beach in Texas following Hurricane Harvey has been identified. Preeti Desai found the decaying fish on a beach in Texas City, and asked Twitter for help. She posted several photos with the caption: "Okay, biology twitter, what the heck is this?" Her request was passed to biologist and eel specialist Dr Kenneth Tighe, who believes it is a fangtooth snake-eel. He said it may also be a garden or conger eel, because "all three of these species occur off Texas and have large fang-like teeth". It is thought that Hurricane Harvey, which brought strong winds and flooding to Texas, could explain why the creature was washed up. The fangtooth snake-eel, also known as a "tusky" eel, is usually found in waters between 30 and 90 metres deep in the western Atlantic ocean. Ms Desai, who was at the beach assessing the damage from the hurricane, told the BBC: "It was completely unexpected, it's not something that you'd typically see on a beach. I thought it could be something from the deep sea that might have washed on to shore." "My main reaction was curiosity, to figure out what the heck it was," she added. Ms Desai said she posted the images on Twitter because she knows a lot of scientists use it, and a friend soon responded and contacted Dr Tighe. "I follow a lot of scientists and researchers. There's such a great community of these folks that are very helpful, especially when it comes to answering questions about the world or identifying animals and plants," she said. She said she left the eel on the beach "to let nature take its course".